To perform a quick check of your PDF document with Adobe Acrobat X, check Tools, Accessibility, Quick Check. Choose Tools, Accessibility, Full Check. Check the box next to Create accessibility report and choose a save location for the report. Make sure to check the box next to Include repair hints in Accessibility Report. This will provide you information on how to fix the errors found by the accessibility checker. Choose whether you want to check the entire document or a page range. 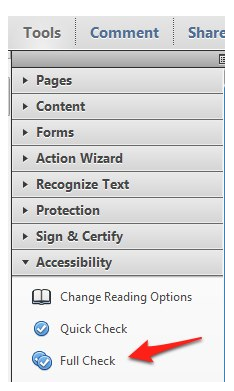 Under Checking Options, check which set of guidelines you want to use for checking your PDF document (Section 508 is the U.S. accessibility law, while WCAG 1.0 and 2.0 are international accessibility standards). For the selected standard, select the priority levels or guidelines you want to check against, or check the box next to Select All for a complete check. To access additional information for each standard, click the Browse button at the bottom of the window. This will open the website for the selected standard in your default web browser. Choose Start Checking. When the check is complete, you will see a pane on the left side of the window that will report any errors along with additional information on how to fix them (if you selected that option before running the check). 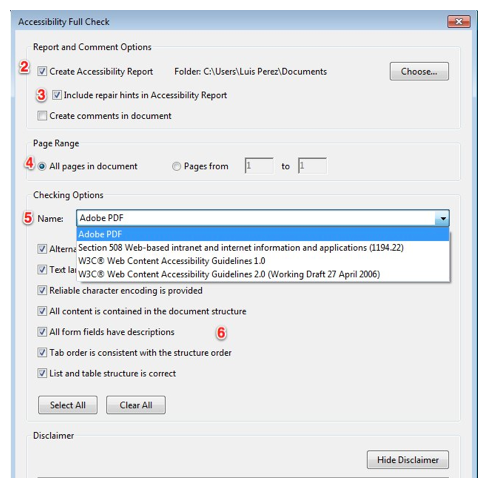 Adobe Acrobat’s accessibility checker provides a good starting point for evaluating the accessibility of your PDF documents. However, remember that it is an automated tool with some limitations. It should be seen as a starting point for accessibility, not as a replacement for the input of the people with disabilities in your intended audience.